We are unique in our process and the equipment we use. We pride our commitment to new innovations as technology constantly changes. With our Industry leading reports which include Video clips (since 2011), and using the latest professional tools, we strive for 100% client satisfaction by spending that extra time required with clients, fully explaining our findings. We do not pass or fail any inspection; we simply deliver the facts on our findings. High resolution thermal camera and professional measuring devices/meters and tools. Over 20 years experience as a licensed contractor in BC. Onsite/online electronic reports complete with Video clips, Photo’s and Illustrations. Delivered on our signature USB card. "Thank you - once again, so impressed and pleased by your inspection and the level of detail. You definitely instilled confidence in my mind about such an old house, which for someone who’s never lived in such an old building before, seemed quite daunting! “Excellent work! Very thorough and explained all the systems. Thermal imaging is excellent and highly recommended”. 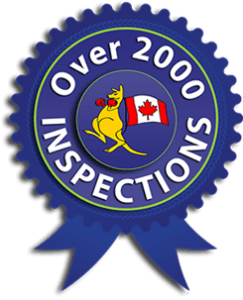 “Darryl provides an online report which allows me to view my clients' inspection, and includes a separate summary report which I can forward if needed. I also have access to ALL the inspection reports for ALL of my clients past inspections that Darryl has performed. AMAZING! Great job & thanks for helping my clients make an informed decision”.